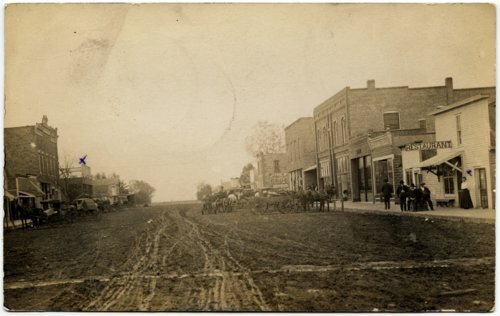 This sepia colored postcard shows a view of store fronts and wagons along the main street in Lebo, Kansas. The only visible business signs are for a restaurant (front right) and Jones Groceries and Dry Goods (middle right). The town is located about twenty miles northeast of Burlington, Kansas.